"A country pub in the city"
Hartigan's has been around since the early 1720's, and although under different names and different owners, the true tradition of a proper decent pint of plain (and all other drinks), with a friendly and cosy athmosphere has reigned throughout the years. 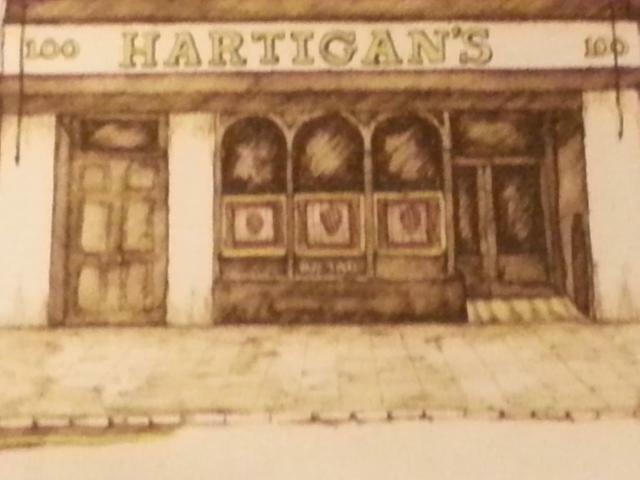 The Mulligan family would like to extend a very warm welcome to you on the introduction of their new official Hartigan's website. Post: 100, Lower Leeson Street, Dublin 2, Ireland. 100% quality at N°100.....This is all you'll need to buy one of the best pints of the black stuff in the country. You can now send an email to a customer by using the following email address, and we will print it up and leave it behind the counter for them to collect. Please don't forget to put the customer name in the subject box. E&OE. All facts correct at time of publishing, prices subject to change at any time, and a current price list will always be clearly placed outside the premises, as per current legislation, in EURO and inclusive of VAT and Excise Duty.